How did this program get established? On January 6, 2003, Christian Women’s Job Corps of Granbury (a faith-based organization) opened its doors to serve women of all ages, race and religious backgrounds. In 2016, the program was expanded to include evening GED classes and computer classes. In March of 2015, the Board and staff recognized that changes to its program and services were necessary in order to assist more people in the community. On September 15, 2015, we offered our first class using the Jobs for Life™ curriculum. This class was so successful that we knew the time was right to expand our program to include men as well as women into all of our programs. As a result, on January 11, 2016, our name changed to Forward Training Center of Hood County. See our mission statement and here. Forward Training Center is a 501(c)3 non-profit organization & donations are tax-deductible. Our classes, programs and the accompanying child care/meals are completely FREE to students. 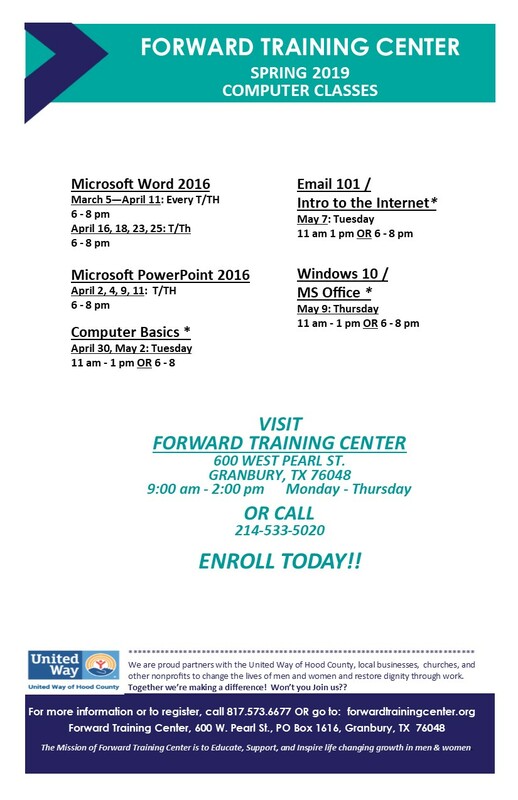 Forward Training Center of Hood County depends on our individual donors and grants, as well as area businesses, organizations and churches. What is the criteria for admission? See the full list of criteria here. I can’t donate money, what else can I do? Besides monetary donations, one of the biggest things you can give is your time. Our programs include mentorships to the students, which are purely volunteers giving their time each week. Some give more time than others, and that is completely okay! These relationships often become like family to our students. Additionally, if you have a small business, some of our students and graduates are looking for job opportunities. If you have one, please let us know! Have additional questions, just give us a call! We would love to answer them.